September has arrived again, the morning's damper and darker and already a hint of autumn in the air. A sense of excitement and trepidation as the new school year beckons and once again I'm sucked in by its promise of new beginnings and new starts and have signed up to a Slimming World class and a new yoga class. September for me is like January and each year I find, like many people do at a New Year, I look to the past and the future, look back and reminisce; look forward and hope. Even in the years (though there were comparatively few of them) that I wasn't actively involved in the education system one way or another, I would still buy an academic year diary- planning my year from September to August rather than January to December. All ready for another school year. This September is no different. 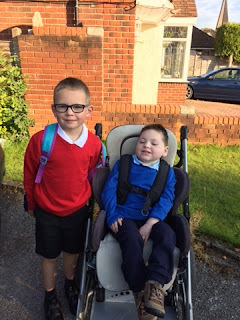 I've reflected on the past two years watching both boys starting school, one in the local mainstream primary, the other a year later in the local special school. I'm not filled with the same sadness anymore that they attend different schools, that one walks in holding my hand, that the other leaves in his wheelchair at the back of a special needs bus. I don't mind so much that their uniforms are different coloured and that the out-grown uniform of the eldest gets passed to friends and neighbours rather than to his little brother. It is what it is and I know both boys are in the best place for them. Though I suspect I'll still shed a little tear as I wave them goodbye on Monday, simply because it marks that passage of time and my two babies are growing up. I look forward to what the year will bring for them too and what they will each achieve. Their accomplishments will be different and those of my youngest will certainly not reflect those of his peers, but they'll be his achievements all the same and I will be equally proud of both children. This year differs slightly though in that for the first time in a long time I'm contemplating returning to school too. As a teacher for many years before the boys came along, the night before school in September would always fill me with a strange combination of anxiety and excitement. One that invariably left once I was back at the front of a room full of children. I stopped teaching when my youngest was born; he was so ill that returning to work was impossible. My time away from the classroom and at home with my son(s) has been a steep learning curve. My youngest has profound and multiple learning difficulties; disabilities that even as a special needs teacher, in a school for children with autism, I had never encountered before. He has taught me a lot. This September dawned with a little more anxiety and a lot more excitement than previous years. I'm looking forward to taking what I have learnt from my own children and using it to make me a better teacher. I'm looking forward to finding that little bit of 'me' again in amongst the other roles that have taken over: mother, nurse, carer, doctor, physiotherapist. I'm looking forward to helping children learn and making a difference in their lives. The school clothes are ironed, the pencil cases packed, the hairs cut, the new shoes bought and polished. September is here and I for one am ready. "What are you looking so happy about?" I came across your inspiring and very moving blog doing some SN Carer research. Your words "I worried endlessly about the future" sums up our research for St Loye's Foundation and http://projectsafe.org.uk. I wondered if you can in any way help us gather more experiences or talk to us more about yours? I know its a bit cheeky but the cause is very meaningful.